Greenburg is a doctoral candidate in the History Department at the University of California, Berkeley. Her dissertation will be on Haiti under United States occupation. On Thursday, 31 October 1929, George Freeman sat in an armchair in his office with his legs outstretched and a pipe in his hand, listening through an interpreter to a student delegation complain that their scholarships had been reduced. Freeman was the director of the Service Technique, the centerpiece of agricultural and vocational education in US-occupied Haiti and an important element of the revisions to technologies of occupation following the brutal repression of the Cacos Rebellion the previous decade. Administrators had decided to re-allocate a portion of funds previously dedicated to merit-based scholarships, which tended to award urban bourgeois students, to a work study-type program, under which students could support their studies by performing manual labor on the school’s agricultural grounds. Before throwing the students out of his office and explaining how easily he could replace them, Freeman replied through the interpreter that the scholarships were thanks to his personal dealings with President Borno, and he could reduce them as he pleased without student input. The student delegation exited Freeman’s office, refused to board the busses that normally shuttled them between Port-au-Prince and the Damien campus, and walked the eight kilometers back to Port-au-Prince. 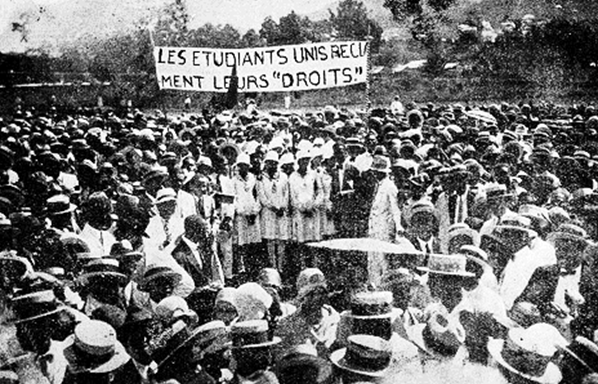 What began as an internal dispute over scholarships would quickly grow into a national general strike so large it would force the US to plan its withdrawal from Haiti. The Damien revolt was a consolidation of years of anti-occupation mobilization and multiple political movements. Within one week, students at all of the other main campuses in Port-au-Prince struck in solidarity. Customs house workers soon followed suit. Political protest mounted throughout November 1929. Protestors burned effigies of George Freeman, who had come to represent the figure of the paternalistic, racist, and highly-paid American expert. On December 6, a small detachment of Marines opened fire on a group of 1500 peasants in the southern town of Aux Cayes, killing a dozen people and wounding 23. The massacre at Aux Cayes sounded the death knell of the US occupation. Widespread international condemnation forced President Hoover to appoint the Moton Commission to evaluate the education system, and the Forbes Commission, which would recommend withdrawal of US forces from Haiti.